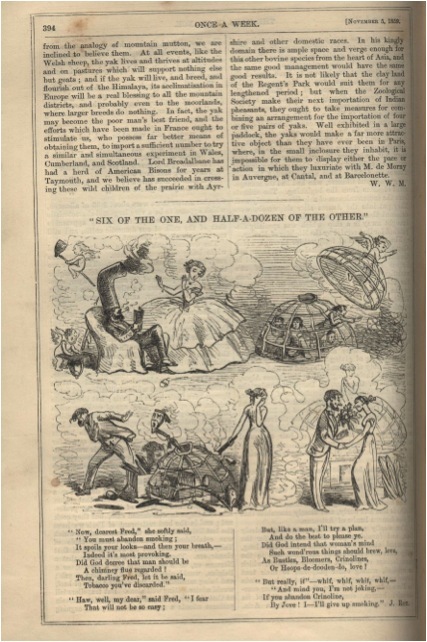 Once a Week (subtitled an illustrated miscellany of literature, art, science, & popular information) was a weekly (hebdomadal) periodical that ran from July 2nd, 1859 to 1879, and possibly to April 1880. A popular publication, it had a circulation of 22,000 per week in 1859 and a total of 570,000 by the end of that year, this period being when “Six of the One, and Half-a-Dozen of the Other” was published (November 1859, vol. I no. 19); in January to July of 1860, Once a Week had a circulation of 150,000, and in 1865 it had lowered its circulation to 35,000. No information is readily available on the poet J. Roy, despite the popularity of the periodical at the time his poem was published. In keeping with Once a Week‘s proclivity for ‘lavish’ (Waterloo) illustrations, a large picture appears above the poem and, indeed, occupies considerably more space than does the poem itself. This humorous dramatic poem has an undemanding, relatively disorganized, changing rhyme scheme, suited to its conversational tone. With exclamations, pauses, onomatopoeias (“whif, whif, whif, whif” (17)), repetition, and emotional or nonsensical utterances (“Haw” (9) and “Hoops-de-dooden-do” (16)), the poem imitates everyday speech to comic effect. Most eight-syllable lines are followed by a seven-syllable one, though even this scheme changes, as in the last two lines, both of which contain eight syllables, so that the metre of the poem likewise reflects, through its variability, the messiness of casual conversation. The illustration above the poem suggests a similar kind of chaos, if also an elevated one—now smoke billows everywhere, a chimney-like top hat spews smoke, cherubs fly in crinolines, and large anthropomorphized tobacco pipes harass and frighten people. Illustrations thus enact the events of the poem in a strange and ridiculous manner, but use normal household objects—hats, pipes, skirt supports—as their bases for doing so. Once a Week, Vol. 1-13. London: Bradbury & Evans, 1859-1865. Print. Leech, John. ” Do you object to my Smoking a Cigar, Sir?” The Victorian Web. Waterloo Directory of English Newspapers and Periodicals, 1800-1900.